The Lutheran Church has a long and distinguished tradition of lay theologians, beginning with Philipp Melanchthon himself, who authored a large part of the Book of Concord but was never ordained. 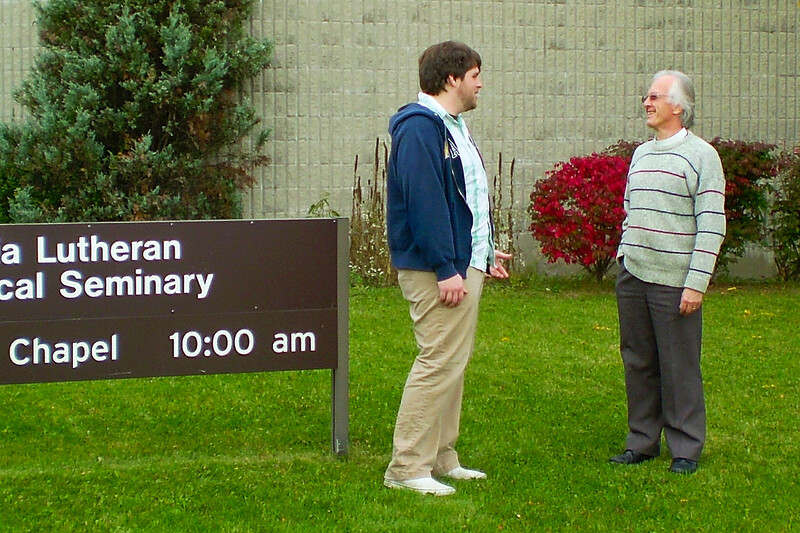 Concordia, St. Catharines, has always recognized the need to provide advanced theological training to men and women who wish to back up their service to the church with a beefy understanding of the Christian faith. The Master of Theological Studies programme, available to qualified individuals from any church background who hold a baccalaureate degree, is the place to get it. As part of the seminary’s self-study leading to accreditation of its degrees with the Association of Theological Schools, the MTS has been comprehensively rethought. The number of credit hours required has been reduced to 54 hours, making it much easier to complete in two years. In addition, students who choose a major in biblical studies will receive some credit for their work in biblical languages. And the core course requirements have been strengthened to ensure that all the basics are covered before students proceed to their research elective. At present Concordia has two students in the MTS programme, with a third likely to enter next year. We have also had two long-time students who have taken the coursework for personal enrichment, without desiring to complete the degree. The MTS has recently attracted a lot of attention from LCC deacons and mature Christians who would like to explore their faith further. If this sounds like you, please contact us to learn more (see www.brocku.ca/concordiaseminary). Hi what is a Bachelours degree.What does that have to do with Lay Preachers? Lay Preachers are workplace Christians who share their faith in all they do. Our Church is in dire need of more Lay Workers. We need a more hands on Ministry where the Laymen Preacher is actually equipped to share our Lords Word in a clear and concise manner. University degrees have little if nothing to do with that. Just ask you local carpenter. Can He communicate to build a house can he teach an apprentice? I believe after Confirmation in Lutheran Church Canada a person is well equipped in the Word. A foundation so to speak but indeed the start of a building. This building is then built on the foundation with the experience of many years of prayer. Over time a home is built in faith in which a relationship with our Lord exists. For Faith is how we are saved and it is a gift. Given by Our Lord and Saviour. This gift called the present is where we all exist. Our Lord is the Lord of the Past the Present and the Future. He is omnipresent understanding beyond our present. His word is our University learned men may try to capture His Grace and Accolade themselves in His study but other learned men will take His word and quietly or not so quietly go to all ends of the earth in their vocation and pray and feel the needs of Gods people and meet them where they are. At Work what they have been called to do. So with out merit one must continue ones work. May the Lord be with those who want to learn His word providing mentors at every step of their way. Hi, Tom. The Master of Theological Studies degree is not for everyone. Indeed, learning Luther’s Catechism is enough to be well equipped to speak the faith. But the church still needs people who are more highly trained in the knowledge of the Scriptures and the truth of God’s Word. St Paul tells us that we need to be able to discern false teaching and show it for what it is. There’s need in our church for both kinds of lay people.